Their Senterprise pedigree dairy herd was responsible for many top-notch milkers at Skipton Auction Mart’s Craven Dairy Auctions throughout the year - champions, reserve champions and multiple prize winners among them – along with numerous quality dairy-bred rearing calves. Their consistent performance all year long saw the Housemans, with the support of their wives, Margaret and Tina, first win the dairy cattle and rearing calves category of the awards, before landing the overall title. CCM’s annual awards scheme recognises the contribution of regular vendors at Skipton Auction Mart and honours a champion among them. Points are awarded for both prize winners at livestock shows and highest priced stock in several categories at weekly sales throughout the year. 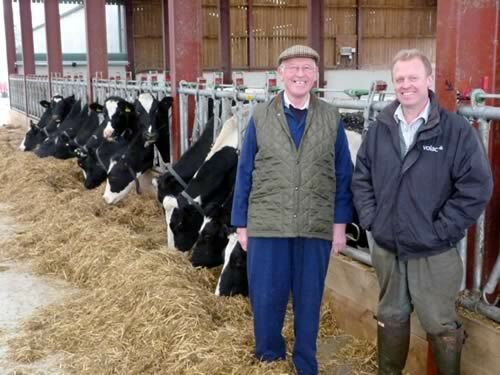 The Houseman family’s roots originated in Nidderdale, with Fred’s father William first moving to Church Farm, South Stainley, in 1943, until, in 2009, Fred and Mark took over a greenfield site near Burton Leonard, on which they constructed a purpose-built dairy unit and a new house. Development of the site is ongoing. They now have some 330 dairy cows and were milking 280 at the year end, averaging 31 litres per cow per day at 4.15% butter fat, 3.4% protein and a cell count average of 150. All their milk goes to Paynes Farm Dairies in Boroughbridge. Always looking to maximise cost efficiencies, they have now started to grow more of their own forage on their 640-acre holding, with 180 acres given over to wheat, 150 to maize, 55 to barley, with grass taking up the remaining 255 acres. The Housemans also farm a further 200 acres of arable land in partnership with Fred’s brother John and nephews William and Richard. They are also now using weaner rations and milk powder from BOCM Pauls, main sponsor of both the monthly Craven Dairy Auction and seasonal rearing calf shows. Father and son farmers also lifted three more award categories. The prime sheep title went to Frank and Robert Fielden, of Todmorden, with prime cattle honours falling to Trawden’s Jimmy and Paul Baines – Mr Baines Snr is himself a former CCM Farmer of the Year. North Craven’s David and Robin Booth, who trade as WA&A Booth in Feizor, won the breeding and store sheep category, while Sheila Mason, of JH&SM Mason in Keasden, collected the most points in the breeding and store cattle section.